Nellie Ohr, wife of twice-demoted DOJ official Bruce Ohr is refusing to appear for a Congressional deposition that was supposed to be conducted in a closed-door session Friday. “The Committee continues to seek the testimony of Nellie Ohr and Jim Baker and will compel their testimony if necessary,” an aide to House Judiciary Committee Chairman Bob Goodlatte told The Daily Caller News Foundation. The House Judiciary and House Oversight Committees sought to question Nellie Ohr after her husband Bruce Ohr gave an explosive testimony to Congress. 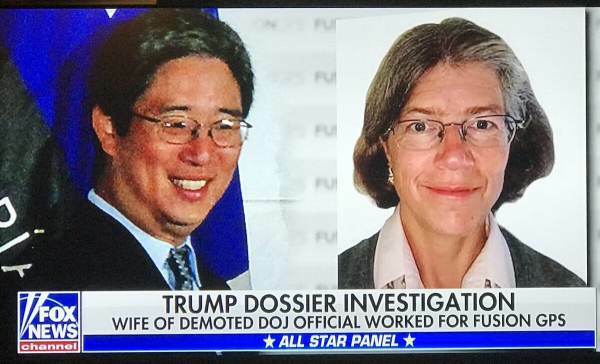 The former Associate Deputy Attorney General told Congress the FBI knew his wife, Nellie Ohr worked for oppo research firm Fusion GPS yet failed to disclose that information to the FISC [Foreign Intelligence Surveillance Court]. Nellie Ohr was paid multiple large payments by Fusion GPS, the oppo research firm that commissioned dossier author Christopher Steele. Mrs. Ohr also previously worked for the CIA and was a corrupt Communist sympathizer who spoke fluent Russian–both important pieces of information the fake news media glosses over. It is time for the House Judiciary Committee to issue Nellie Ohr a subpoena. Update: GOPers on House Judiciary Committee say they will compel testimony of Fusion GPS’s Nellie Ohr and former FBI General Counsel Jim Baker if necessary. GOPers on Hse Judiciary Cmte say they will compel testimony of Fusion GPS’s Nellie Ohr and fmr FBI General Counsel Jim Baker if necessary.